A very basic design track made from scratch using only Google Earth, Bob Track Builder and rFactor AIWCAM Editor. Thanks to the people that have contributed for the BTB XPack files so far. Some basic changes from the Beta version .. plus both Tracks, national and A1GP are availbale. There are currently no setups for Taupo 2008. Add a Setup. Can I convert this track to F1 Challenge '99-'02? How nice you all have been racing this track. I have all possibilities trying to install it - it does´nt work... Regards! cars don't follow grid slots they go in a straight line through the pit wall? 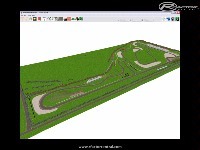 Hi Kaspa, the official web site shows different track layouts.. I took the one from Google earth. Do you have a plan view of the correct layout that you can send me? thanks man, i have been on taupo many times, i hope there is the camber ? Please use the latest download link under ..: "Taupo2008 rev. 1.0"
I'm still learning a lot about AIW files and originally I had major problem with this track.. Does anyone have a link to a Forum dedicated to this AIW file? Very nice work on the track. A couple of problems I see though are the AIW don't pit in their stalls during practice and the grid itself only holds 19 cars. The garages hold quite a few cars which is good. Would it be possible to make the grid bigger to allow for more cars to race? Unable to download track thru Mediafire. Invalid file error.